I don’t believe in mistakes. Everything belongs, and, as the homies say, “It’s all good.” I do believe in lessons learned. I have learned that you work with gang members and not with gangs, otherwise you enforce the cohesion of gangs and supply them oxygen. I know now that gang warfare is not the Middle East or Northern Ireland. There is violence in gang violence but there is no conflict. It is not “about something.” It is the language of the despondent and traumatized. In my 30 years of ministry to gang members in Los Angeles, the most significant reversal of course for me happened somewhere during my sixth year. I had mistakenly tried to “save” young men and women trapped in gang life. But then, in an instant, I learned that saving lives is for the Coast Guard. Me wanting a gang member to have a different life would never be the same as that gang member wanting to have one. I discovered that you do not go to the margins to rescue anyone. But if we go there, everyone finds rescue. Me wanting a gang member to have a different life would never be the same as that gang member wanting to have one. Louie was 19 years old, a gang member making money hand over fist by running up to cars and selling crack cocaine. He quickly became his own best customer. After my many attempts to get him into rehab, he finally agreed to check himself in. He was there one month when his younger brother Erick did something gang members never do. He put a gun to his temple and killed himself. Gang members are much more inclined to walk into enemy turf and hope to die than to pull the trigger themselves. When I arrive at the rehab center, Louie greets me with un abrazo, and once in the car, he launches in. “I had a dream last night—and you were in it.” In the dream, he tells me, the two of us are in a darkened room. No lights whatsoever. No illuminated exit signs. No light creeping from under the door. Total darkness. We are not speaking, but he knows I am in the room with him. Then, silently, I pull a flashlight from my pocket and aim steadily on the light switch across the room. Louie tells me that he knows that only he can turn the light switch on. He expresses his gratitude that I happen to have a flashlight. Then with great trepidation, Louie moves slowly toward the light switch, following closely the guiding beam of light. He takes a deep breath, flips the switch on, and the room is flooded with light. As he tells me this, he begins sobbing. “And the light,” he says, “is better than the darkness.” As though he had not known this was the case. We cannot turn the light switch on for anyone. But we all own flashlights. With any luck, on any given day, we know where to aim them for each other. We do not rescue anyone at the margins. But go figure, if we stand at the margins, we are all rescued. No mistake about it. It is a fantastic read or listen. The link to Fr. Boyle's great book about his experiences with gangs in Los Angeles is above. I recommend it to everyone. America posted an interview by Sean Salai with Fr. Boyle in August of 2014 but I cannot post that link because it will not post. One way to find the interview is to go into the search above and type "saving gang members." It is worth the effort. This article also appeared in print, under the headline "I thought I could “save” gang members. I was wrong.," in the May 15, 2017 issue. 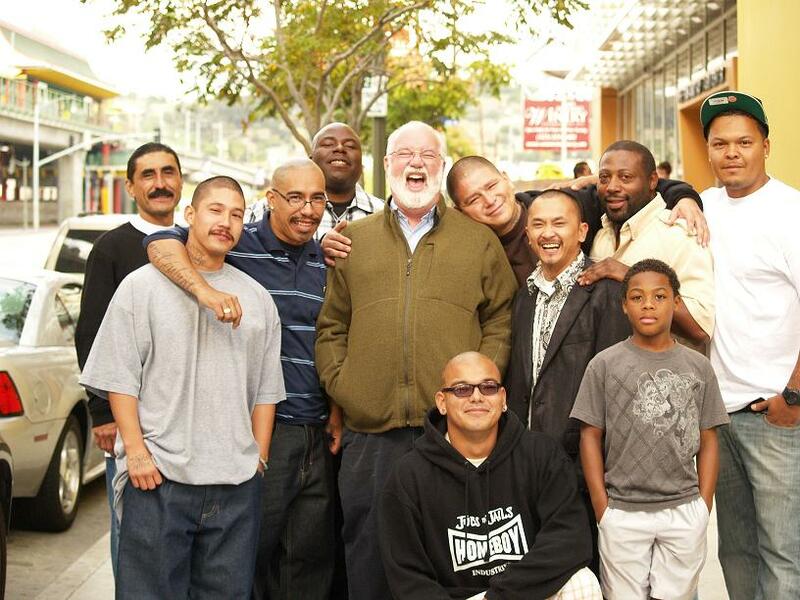 Father Greg Boyle, S.J., the founding director of Homeboy Industries, has worked with gang members in Los Angeles for over 30 years.